I was pleased and honored to find myself commemorated in the SaltCon "Swag Bag" by Don Lloyd of Knight Works--I'm now officially a character in his game Dark Horse! Thanks, Don! 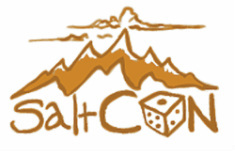 _For information about the Board Game Designers Guild of Utah (of which I am a member), click here. Click here for links to websites and publication companies belonging to specific Guild members. If you want to visit a really wonderful board game shop in Salt Lake City, I recommend Game Night Games.